Mrs. Knapp's Character Education club is focusing on the character trait courage this month. Students are learning how to be brave and try new things. On February 5, 2019, the fifth grade G&T students attended an Astronomy Convocation at The Meadowlands Environmental Center in Lyndhurst, New Jersey. This convocation entitled "The Sun Through Time" was a multidisciplinary workshop based on the theme of solar astronomy. 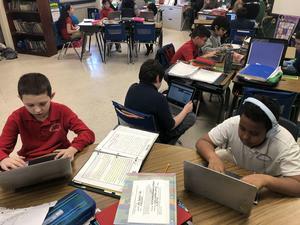 Our fifth grade students participated in one of four modules investigating humans' understanding of the sun through time with ancient cultures, sundials, telescopes, solar energy and modern solar study. 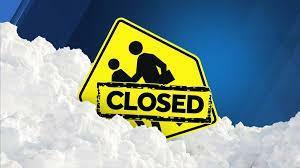 Secaucus Public Schools will be closed Tuesday Feb 12 due to inclement weather. Registration will take place Feb. 4th, 2019 thru Feb 7th, 2019. 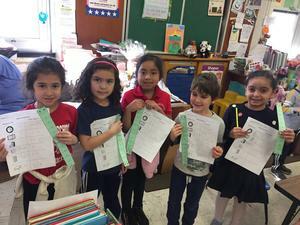 Mrs. Jaramillo’s Kindergarten enjoyed some pre Groundhog’s Day fun this Friday. Following some discussion and readings, the class charted their predictions then made puppets and explored their own in class “burrow” to act out what Punxsutawney Phil will do on Saturday. 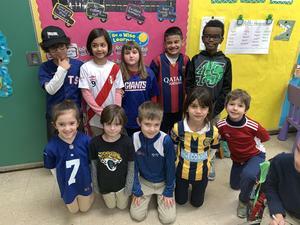 Our annual St. Jude Jersey Day was a huge success. Students and teachers showed their team spirit while supporting this amazing cause. Thank you for your support. The fourth grade students have been working hard on their reading skills. They have been reading paired passages on “CommonLit” a reading website where students have access to reading passages, comprehension and analytical questions, as well as writing response questions that can be graded by teachers and sent back to students with suggestions for improved writing. 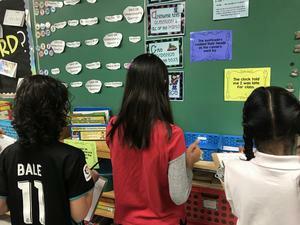 Fifth graders in Ms.Sallustio's and Miss.Primavera's class participated in a "Figurative Language Gallery Walk" to help improve and identify figurative language skills. using the inchworm measuring tool. Learning about inches during the letter “Ii” week has been so much fun. Students got to work with a partner measuring various things in the classroom. Students had an “incredible “ time “inching” their way around class! !